Let’s face it, this entire movie series was just leading up to the scene in this movie towards the end where Bilbo meets Smaug and all hell breaks loose. And hey, that scene delivers. It’s intense and fun, but it results in a bit of a let down when the movie ends shortly after it. After a lot of padding and unnecessarily drawn out scenes, we get to the good stuff and then the movie is over! In some ways I don’t mind Jackson fleshing out this story and adding a little more depth, but at times in this one (more so than in the first film) I found myself getting a little frustrated with some scenes that just went on too long or didn’t seem to belong. I could feel it being pushed out to 3 movies. That being said, it’s still a pretty fun ride. I saw it in 3D IMAX and that was a bit much. I need to see it again in 2D just to catch a few moments in the action scenes that I missed the first time around. It’s good. Real good. Way to go Joss Whedon. I haven’t even seen Incredible Hulk, Captain America, or Thor, and I didn’t feel like I was too far behind. My only complaint would be that Loki wasn’t the most exciting villain. Or maybe it was the performance by Tom Hiddleston that I wasn’t impressed with. It’s hard to say. It wasn’t terrible, but I think a more menacing villain usually works better. He struck me as more bratty than menacing. Most surprising element = how much I enjoyed Scarlett Johansson as Black Widow. Whedon knows how to write interesting female characters that can also kick some tail, and Scarlett did a good job with all of it. I probably don’t need to really sell anybody on this particular movie, but it’s definitely entertaining and worth a watch on the big screen. Even the crying baby and talking kids in the theater didn’t ruin it! Stacey: Scott, was she really the one? Stacey: I mean, did you really see a future with this girl? Scott Pilgrim (Cera) falls instantly in love with a mysterious girl, Ramona (Winstead), that he meets at a party, but once the two begin to date, Scott discovers that he must defeat – in combat – Ramona’s seven exes. So when did it become commonplace in movies for the geeky, loser-ish guy with no confidence to have dated, or currently be dating, multiple very attractive women? Maybe that’s part of the whole comic book/graphic novel fantasy experience, which is what this movie is based on, a graphic novel series by Bryan Lee O’Malley. I was not at all familiar with the graphic novels before seeing the movie, so I don’t have those to compare the movie to. So, just judging the movie on it’s own merit…it was pretty good. I probably don’t even need to bother saying that Michael Cera is playing basically the same character that he always does. Though, I will say that for some reason he’s less likable than usual here. Which leads me to my biggest complaint about the movie. I really didn’t care much about either of the two main characters. Cera is very needy, and kind of a selfish jerk at times, and Ramona is like a rehash of Clementine Kruczynski but without the depth or likability. Why do these two people like each other? I can understand Scott being initially attracted to Ramona, but after that, neither seem to have much to talk about, and they certainly don’t seem to have much fun with each other. I think more chemistry between the two would have lent more weight to Scott’s battle for Ramona. As it is, I was wondering why he’d want to even go through the trouble of fighting for her. On the bright side, there are quite a few funny moments, and a lot of good cameo appearances by actors that get to have fun with their roles. I especially liked the inclusion of one of Michael Cera’s Arrested Development castmates as one of Ramona’s exes. The overly stylized approach taken by director Edgar Wright (Hot Fuzz, Shaun of the Dead) wore me down a little bit by the end, but that might have had more to do with the repetitiveness of the fight scenes rather than the fast paced editing. It mostly works, but the movie felt overlong. Plus, the ending was a bit disappointing. I thought the narrative lost its way a little and got bogged down in a lot of confusing dialogue. Still, overall it’s a fairly entertaining experience. I just wish as much time was spent on character development as was spent on editing and special effects. Also Michael Cera’s hair looked weird. Your past shouldn’t control your present…? Spyros: The bond between us, it’s much more than just flesh and bone. The love we have for you…it’s that love that gods and kings fight over. Mankind has grown tired of the gods ruling their lives, so they rebel. Zeus (Neeson) is not happy about this, and allows his brother, Hades (Fiennes), to put mankind in its place. But the gods didn’t count on there being a demigod (half man, half god), Perseus (Worthington), living amongst the humans and willing to fight for them. I used to watch the 1981 version of this a lot when I was a kid, but I suppose I just let all of the boring talk about mankind rebelling against the gods go right over my head while I waited for the giant scorpions, Medusa, and the Kraken to show up. While watching this remake, I came to the realization that, despite having seen it numerous times, I had no real concept as to what the Clash of the Titans story was about. There were just too many silly distractions in the original for me to care about the story. Well, that’s not as true for the 2010 version. It’s a little more serious, and a little less fun. This version only betters the original in a few scenes. Most notably, the giant scorpion sequence. That was pretty cool. It’s not terrible, though. 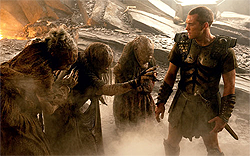 Sam Worthington is good, there’s some good action, and a few funny moments. But overall, it often just seems like it’s going through the motions. There’s no heart to it. As is often the case nowadays, the characters get lost in a sea of computer generated imagery. It’s impressive imagery at times, but that’s not enough to elevate it above all the other big budget special effects extravaganzas we keep seeing. Plus, there were two major disappoints for me. One, Medusa. She was much scarier and interesting in the original. The Harryhausen stop motion effects actually worked better for her than the slick computer generated effects do. And where was the two-headed dog guarding her lair?? I was pumped to see them fight that thing, but alas, it never showed. The second big disappointment was the Kraken. Booooorrrrring. He’s barely in it, then when we finally see him, he’s just a sort of nondescript tentacle monster. I prefer the weirder 1981 version with the rock hard abs. which is your favorite Kraken? 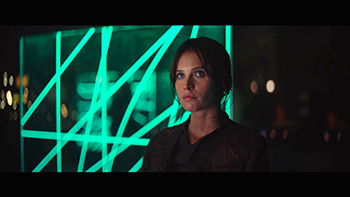 All in all, while I never felt particularly bored during the movie, I did notice my interest in the characters’ plight waning as the end approached. Maybe that’s a product of me knowing where the story was going, but if that’s the case, a good movie should be enjoyable even if you know how it’s going to end. It should be more about the ride and not just the destination. Don’t mess with the gods…unless you yourself are at least part god, in which case, have at ’em. Buckley: Grandma, I know where Susie is. Grandma: Yeah, Susie’s…gone to heaven, sweetheart. Buckley: Lindsey says there is no heaven. Grandma: Alright then, she’s dead. Buckley: You might be dead soon. Grandma: Why do you say that? After being murdered, Susie (Ronan) is stuck in a sort of limbo between earth and heaven, unable to move forward due to the ties she can’t break. Meanwhile, her family struggles to move on after being struck by this tragedy. Yikes, this movie is just all over the place. Is it a serious drama about a murdered 14 year old girl? Is it a Twilight-esque love story? Is it dark and scary? Is it a family movie with a few comedic interludes? Well…it tries to be all of them, and only succeeded occasionally. I liked some of the visuals and the idea of Susie being unable to leave behind her need for vengeance and her desire to protect her family. That stuff was pretty good, but the entire romantic subplot involving her need for one kiss with this boy she knew for about 12 minutes was tiresome. As was the entire grandmother character. She’s supposed to be some big whirlwind of personality, but she feels totally out of place in this movie. Especially the montage of her cleaning up the house. It reminded me of the clean-up montage featuring Goldie Hawn in Overboard. That fit in that movie…not in this one. Also, I hate to say it, but Mark Wahlberg once again displays his lack of dramatic acting ability. Plus, he and Weisz have absolutely no believability as a couple. No chemistry there at all. For this movie to work, the family needed to feel like a real, loving family, and it doesn’t. It all just feels fake. The only real quality performance is from Stanley Tucci. He is very very creepy as the killer, George Harvey. Maybe too creepy, as I’m not sure what kid (or adult) would trust that guy for a second. The imagery of semi-heaven, or whatever it may be, is alright, but nothing profoundly great. Those kinds of sequences are more in Peter Jackson’s wheelhouse, so I was expecting a little more from them I guess. There are a couple of other good moments, and it will surely draw a tear or two at times (a story about murdered children is bound to), but all in all, it just feels like a big jumbled mess. I’m sure the book had more room to expand on certain characters and themes, but obviously they couldn’t all fit into the movie. So, we’re left with some shallow characters and a lot of confusing scenes. Don’t follow creepy men into their creepy underground bunkers. Mr. Fox: Wake up everybody! They’re digging us out! Mrs. Fox: They’ll kill the children! Mr. Fox: Over my dead body! Mrs. Fox: That’s what I’m saying! You’d be dead too in that scenario! Mr. Fox (Clooney) is an expert chicken stealer. He promises his wife (Streep) that after their son is born, he’ll leave that dangerous life behind, but a few years later he’s back to his thieving ways. This brings trouble down on his family and friends. Can the Fantastic Mr. Fox outsmart the human farmers he’s been stealing from, or will they manage to finally kill him? Do you like Wes Anderson movies? Do you enjoy deadpan, dry humor? Do you like characters that are mean to each other, but in a sort of sweet way? Characters that are self-centered, but eventually learn to think about others first? Those are the kinds of things you’ll see in Wes Anderson movies, along with good – usually older – music. That’s all present in Fantastic Mr. Fox, and it all works well for the most part. I thought the movie lost a little steam towards the end, but it’s still funny enough throughout for me to like it quite a bit. The voice work by the leads is good, but not outstanding, though I thought Schwartzman, as Mr. Fox’s son, Ash, may have fared the best. Poor little Ash is constantly trying to be noticed and impress his father. When his cousin, Kristofferson (Anderson), comes to live with the Fox family, he immediately impresses Mr. Fox, which angers Ash even more. It’s really just your typical Wes Anderson type story, featuring a group or family of misfits, who initially don’t get along too well, that must deal with adversity by growing closer. It just happens to be told in the form of stop motion animation. It’s not the smoothest animation in the world, but that’s by design I assume. It gives the movie a strange feel, but that’s okay, it’s a strange story. To answer my own question up above, I do like Wes Anderson movies. I like the angry, but willing to change, characters. I like the soundtracks (great use of Beach Boys music in this one). I like the humor. While this one is not yet one of my top 3 favorites of his, I do plan on seeing it again soon. To kill a chicken, you want to do it quickly, with one swift bite to the neck. wanna see something *really* scary? Cindy Lou Who: Santa, what’s the meaning of Christmas? The Grinch (dressed as Santa): VENGEANCE! Er, I mean… presents, I suppose. The Grinch steals all the Christmas stuff in Whoville. Actually, they make the plot a lot more complicated than I’ve described so eloquently up above. That was one of my problems with it. It’s overlong and over plotted. In the original story, the Grinch was just an overly grumpy character who didn’t like all the noise in Whoville and wanted to ruin Christmas for them. In the movie, at first it seems like they want to say he’s been mean since birth, but then we see a whole story about how he was picked on and not accepted by a lot of the Whos. In fact, the real villain in the movie seems to be the Mayor of Whoville. He’s all about commercializing Christmas and making sure the Grinch is seen as the monster he’s perceived as. The mayor is the one who originally picked on the Grinch so much when they were kids that he ran away to his mountain top home. The whole thing felt like a Batman villain origin story actually. It also kind of looked like it too. There’s a Tim Burton darkness to the look and feel of the movie that didn’t seem appropriate for the subject matter. It seems like it should be magical and mystical and Whoville should be beautiful, but it just looks like a bunch of grungy sets. Plus, the Grinch makeup looks sorta like that thing that Dan Aykroyd turned into at the beginning of Twilight Zone: The Movie. Scary. And why are the Whos so into the commercialism of Christmas? In the original story, they were the true-hearted ones who taught the Grinch what Christmas was all about. 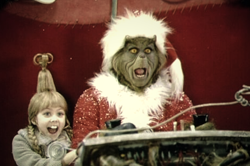 In this movie, the Grinch actually chastises the Whos for being all about gifts, gifts, gifts! Only Cindy Lou Who wonders if there’s something more to Christmas than the giving and receiving of gifts. In the end, it’s just too thin of a story to stretch out over a full length movie, so it’s filled in with lame back stories and a boatload of Jim Carrey’s usual overblown antics. I’d stick with the animated version. It may be 3 sizes smaller than the movie version, but it’s certainly got more heart. wooow...that dinosaur almost kind of looks somewhat realistic...in a way. Matt Lauer: You’ve spent 50 million dollars of your own money studying time warps?? Rick: No…that’s adorable. No, tax payer’s money. I don’t have 50 million dollars. Dr. Rick Marshall (Ferrell) has invented the tachyon amplifier, which allows him to travel sideways in time to another dimension. Along for the ride is Holly Cantrell (Friel) and Will Stanton (McBride), the owner of a little souvenir shop next to the legendary cave that the three encounter a time portal in. I knew going in that this wasn’t a very well received movie, so I was prepared for the worst, and while I can’t say I was pleasantly surprised, it wasn’t as bad as I thought it might be. It was just kind of…there. Not particularly funny, but not painfully unfunny. I laughed a few times, and generally smiled enough to make it watchable. Of course, Anna Friel being in it helped. The character of Chaka is one I could have done without. Just plain old unfunny. And how does Holly speak his language so easily? I guess I’m in the camp that is not annoyed by Will Ferrell. I don’t think he’s all that hilarious, but he doesn’t bother me. He’s usually at his most amusing in subtle ways. Ya know, subtle…like when he’s pouring dinosaur urine all over himself to disguise his scent. Actually, that is a humorous scene, but it goes on too long. That’s kind of the story of the whole movie. The gags are dragged out too long, probably because they didn’t have enough funny stuff written. So, let’s just drag out what we do have! It’s a thin concept and a thin story, stretched out over 102 minutes. It wants to be a big, exciting adventure, but when the T-Rex isn’t around, it’s fairly boring. When in an alternate dimension, don’t taunt the dinosaurs. it's not easy coming up with new dreams for people every night...I'll have to get creative...how about a shark with an elephant face...yeah, that'll work! Shelly: You were so cute. John: I don’t know. I guess I was humbled by you. I will try to sum this up best as I can. There is another dimension that we cannot see, where rival beings exist. The Storytellers give us happy dreams and pleasant thoughts, while the Incubus give us nightmares and sometimes shadow us in our waking lives, continuing to make us prideful, arrogant, and ultimately miserable. When a little girl, Emma (Hunchar), falls into a coma and has her spirit taken prisoner by Ink, a deformed being who longs to become an Incubus, a group of Storytellers try to rescue her. Their only hope is to get Emma’s father John (Kelly), a widower, to care about Emma again and visit her in the hospital. Using my method of describing movies by comparing them to other movies, I’d say this is like a combination of The Matrix, The Cell, and Eternal Sunshine of the Spotless Mind. We spend a lot of time inside the character’s heads during their dreams. So much so that it’s hard to know the difference sometimes. In fact, that’s one of the problems I had with the movie. Everything is shot (or processed) in a weird, dreamy sort of way that grows tiresome pretty quickly. I can’t help but think that this movie would be MUCH better if it were remade with a bigger budget and better cinematography. Oh, and better actors. The line deliveries are pretty painful at times. Though, I’d have to say that little Quinn Hunchar, as Emma, might be the best actor in the movie. If you can get past that, though, you might enjoy a very touching, redemptive story about a man who used to be a caring, good natured father, but lost himself after his wife was killed in an accident. He became so detached that his daughter was taken away and given to her grandparents. So, John immersed himself in his job and became a business god. At least in his own eyes. But to save his daughter, he’s going to have to be torn down again. I know it all sounds convoluted and confusing, and it was for the first third or even half of its running time, but that made the eventual resolution even more satisfying, in my opinion. Got to give writer/director Jamin Winans credit in that area, even if the directing wasn’t up to par with the story. This one surprised me. I had almost given up on it due to the cheap look and the confusing plot, but I’m glad I stayed with it. The pay off in the end was worth it. Over-editing and too much dreamy atmosphere can not make up for a low budget and sub-par actors. But a good story can!